One of my goals this year was to costume in a period I haven’t worked in before. I wanted to do 14th century, but so far I have not found the right fabric for anything but the shift. 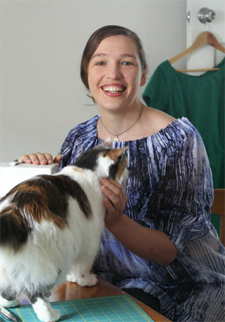 With the year winding up, I decided to think about other periods, and remembered Miranda’s farthingale from the Innovations challenge back in January. I have done 16th c, but only Flemish working class, and that was over a decade ago. Formal English or French Elizabethan is a whole new ballgame! But I own Arnold’s 16thc pattern book, and Elizabethan is a period with LOTS of resources, so I though I’d give it a try. 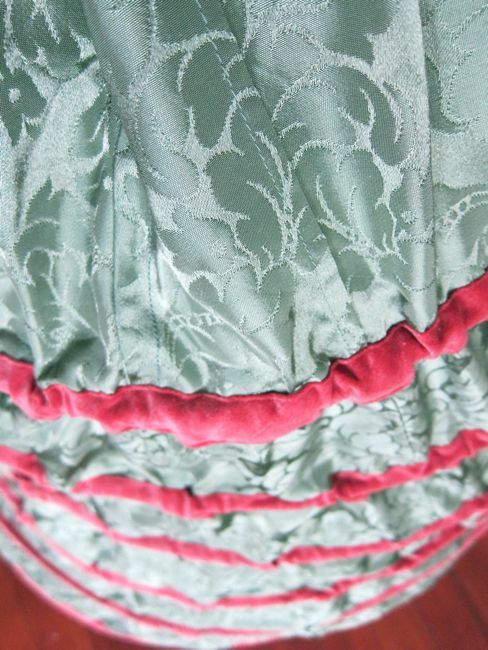 The place to start, of course, is undergarments, and a rummage in my stash revealed that I had exactly the right fabric for a farthingale: a spectacular acetate (or one of the other manufactured natural fibres) jacquard in dark jade green. Not a natural fibre, but exactly the right amount of fabric for a farthingale, and I’m willing to be a little inaccurate as I dabble in Elizabethan. I knew I was on the right track when further research revealed that Queen Elizabeth owned a green farthingale with pink velvet banding. What had I picked up for a song at Fabric-a-Brac in Palmy only a week before I started the project? Pink cotton velvet in the perfect Elizabethan shade! (I know, it looks really hot pink in the photos, but it isn’t in real life) It was meant to be! 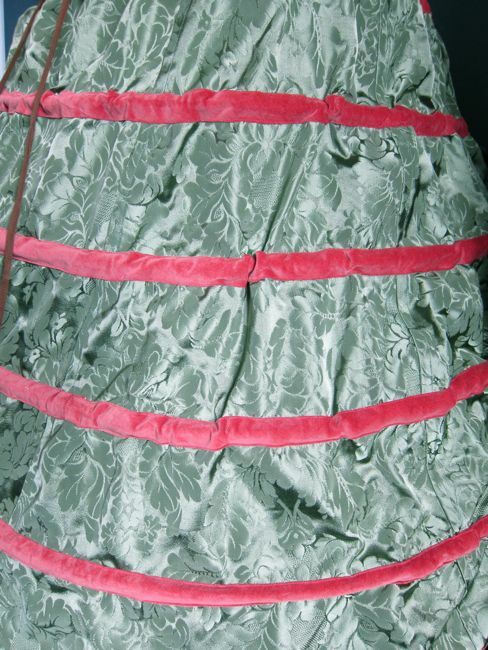 So I analized Arnold’s interpretation of the single 16th c farthingale pattern, and then went rummaging around on the internet for everything else I could find out about farthingales, and found quite a bit (all linked in the HSF write-up down the bottom). And then there was lots of cutting and sewing, and some crying when my camera bit the dust right at the start of the project. 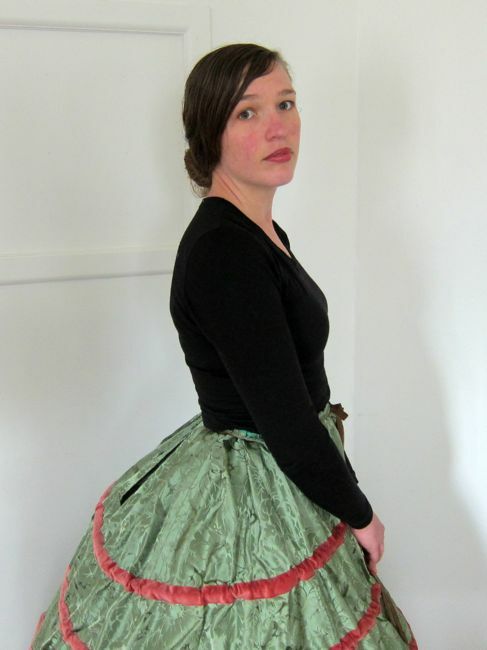 But a new camera was procured, and I persevered, and I have a farthingale! It needs some tweaking, and there are things I would do differently next time, but overall, I am extremely pleased. The main tweaking that I want to do is with the hoop sizes. There is too much of a jump in the bottom two hoops in particular. There are also problems with the cane wibbling and warping and not falling in perfect circles. I have some ideas of how to fix it, but I think simply wearing skirts and petticoats might hide most of it. I did intentionally make it quite big for a farthingale, as I wanted a really full-on, formal look. 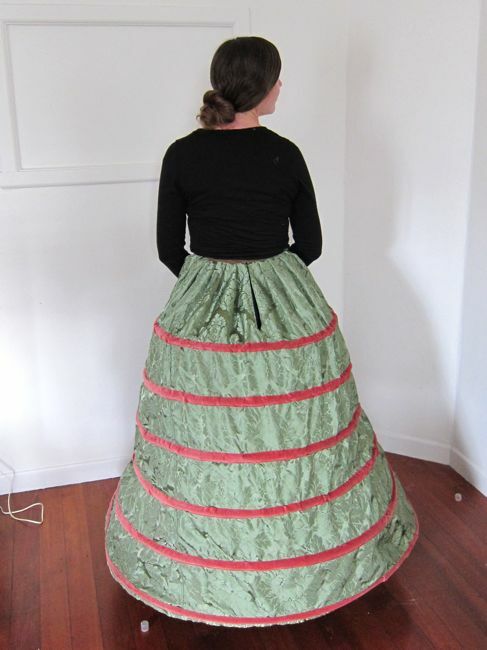 I’m really intrigued by how much it looks like an 1860s elliptical hoopskirt, with the flatter front and fullness concentrated towards the back. Very clever use of gores! 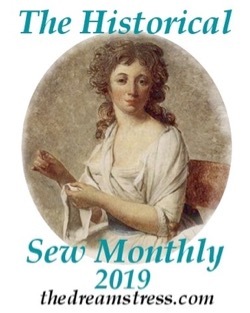 One thing that I noticed in researching the farthingale is that there is lots of research, and two tutorials, but few really extensive blog posts with someone making a farthingale, and their experiences of the tutorials. And the tutorials are quite sparsely illustrated, and you know how much I like obsessively photographed posts. So I photographed EVERY single tiny step of my process, and I’ll be doing a blow-by-blow post of making a farthingale, not as a tutorial in and of itself, but as an accompaniment to the tutorials out there, so that you can see someone work through them and figure things out. This is something that I personally find very helpful, so hopefully other people will too. Watch out for that over the Christmas period when I have a bit of down-time for full-on blogging. Because this is not a period fabric, and because I’m just getting into Elizabethan, everything is machine sewed. 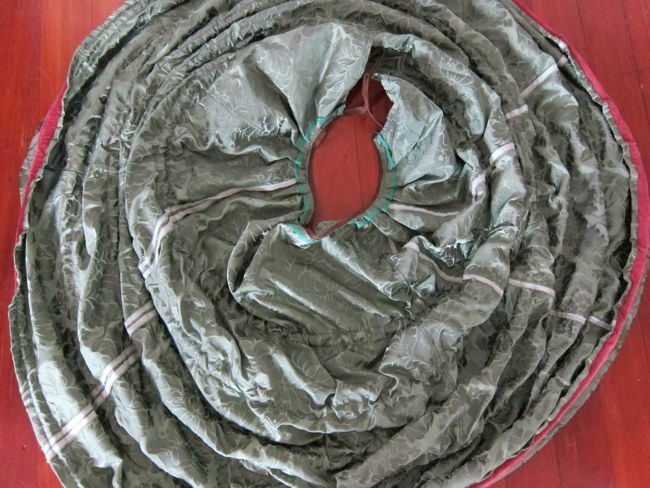 Someday I may make a fully-handsewn farthingale. But first I need a chemise and stays and all the other bits! #2 Innovation: Though farthingales were introduced into England by Catherine of Aragon and her ladies in , they don’t appear to have been incorporated into English fashions until a few decades later, and it wasn’t until the last quarter of the 16th century that ones stiffened with whalebone and cane instead of rope became common. Stiffer hoops allowed extremely wide width of skirts – an innovation in and of itself. 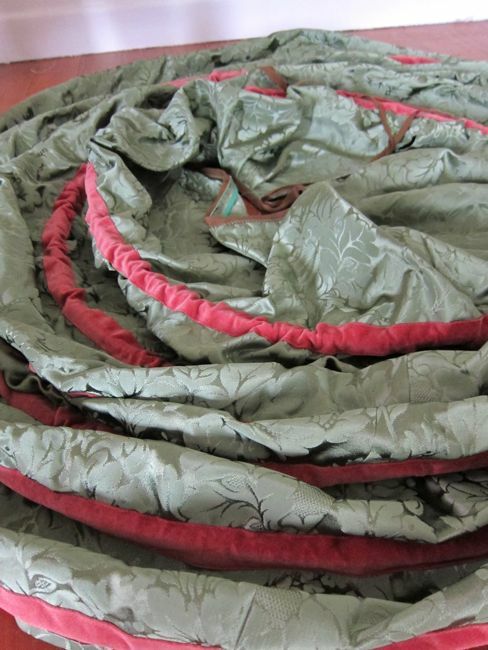 #3: Pink – Velvet hoop channels in Elizabethan pink? I think that counts! #4: Under it All – I don’t have the stuff to go over it yet, but it’s definitely an undergarment! #11 The Politics of Fashion: The introduction of the farthingale into England was the result of a political event, and Queen Elizabeth notably used her clothing to craft and manipulate her image as a ruler. #13 Under $10: The green brocade was inherited from Nana, I picked the velvet up for $6 (and only used a third of it), and the cane cost me $8. 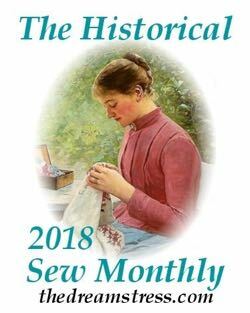 #19: HSF Inspiration: I’d never really thought much about farthingales much until Miranda’s fascinating farthingales for the Innovation Challenge this year, which got me started on research and plotting and planning. #20: Alternative Universe: I really want to do an Elizabethan steampunk outfit based around these! #24: All that Glitters: This is a pretty full-on, glitzy farthingales! Pattern: Taken from Alcega’s 1589 farthingale diagram and instructions, with reference to Janet Arnold’s reconstruction of Alcega’s pattern in Patterns of Fashion, Elizabethan Costumes farthingale making instructions, Renaissance Tailors farthingale making instructions, and Sempstresses analysis of Alcega’s pattern, and chart of hoop sizes. Notions: cotton thread, cane hooping, cotton twill tape, wire, woven cotton interfacing. Hours to complete: Ergh, lots. And LOTS. First worn: Wed Dec 3rd, to demonstrate Elizabethan underclothes to a bunch of Year 9 (US 8th graders). Unsurprisingly, they loved it. The range I’ve seen with my own eyes with that dye is ridiculously impressive. The above is a link to a photo I took a few years back at Pennsic. The lady was using only natural dyes known to 12th – 14th C Northern Europe to get the range of colors you see. Look at the bottom left and you’ll see some very interesting pinks! Anyway, bright pink is perfectly fine for Elizabethan and earlier. I’m not saying that bright pink isn’t fine, simply that it isn’t actually bright pink in real life, instead it is the more muted shade of orangy pink that is actually called Elizabethan pink! But thanks for all the information on colours. Ah! I was confused. I’m so used to people saying “pink isn’t period” and having to yank out ye olde research that it’s become second nature. Sorry! sempstress.orgsempstress.orgYou’ve probably already checked out her page, but sempstress.org is one of my favorite resources for farthingale info. Ah! I see it now. I somehow skipped right over that. Elegant. To wear beautiful underthings is to feel more beautiful. I don’t mean this for a downer — but I wish my mom was able to see your blog. 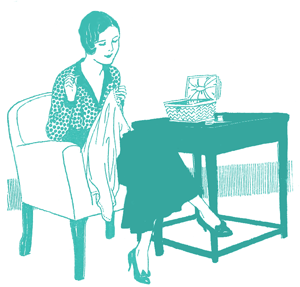 She and I sewed — well, she did everything but the darts and I grumbled. No picture of Felicity snuggled in the farthingale? So good, and such fun! I’m not surprised the children were enchanted. I’m fascinated by the bell shape. 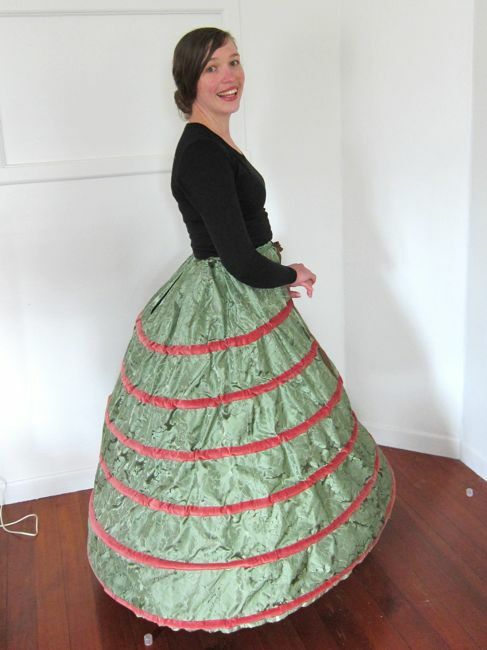 It’s really practically a hoopskirt! And the colours. Lovely shade of green, lovely shade of pink. Thanks an good luck! Am waiting eagerly for your comments on the process. 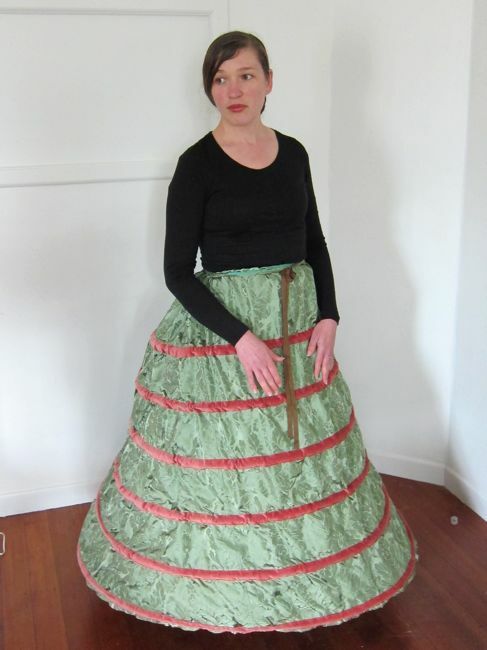 Have made one “farthingale” using recycled stuff, eg discarded tv-cable for the hoops (oops!). It’s definitely NOT historically correct, but perfect enough under a gown for a dance performance. And yes, hoop widths and all that, oh pain, but the garment went on stage. Incidentally this cooked up version of mine is supposed to be easily changed in shape according to need. Haven’t tried that yet so it may be a myth. Wow! 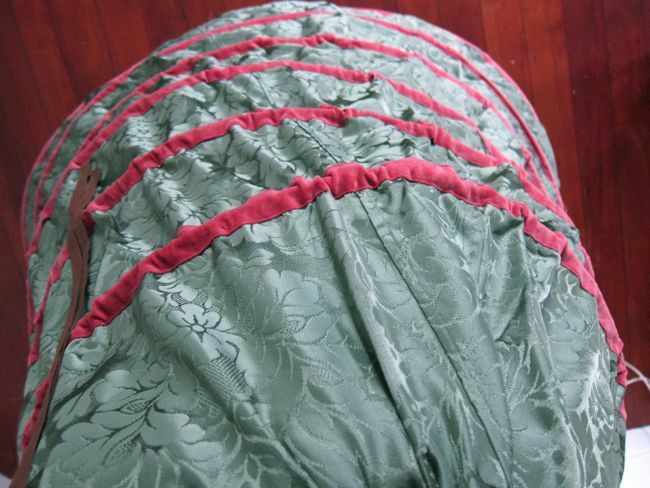 I’ve always wondered how Alcega’s farthingale pattern made up, but never been game to try it myself. It’s fascinating how the gores are shaped to give a flatter front. I’m sure Queen Elizabeth would have approved. She would have loved the colours. I first made this pattern 10 years ago with some really thick hemp rope which I was rather disappointed by the results. I made it up several times last year as well with different ropes (I’m determined to get the ropes right) and fabrics, I want to try a nice firm cane too. I also checked the differences in the pattern between Alcega and Arnold’s interpretation and there is a small width difference, hardly enough to bother with especially with Alcega saying it can be made bigger if desired etc. It’s a really interesting study that I’ve been meaning to write about (if I can ever get enough space to take photos of them and find all of my notes.) I might have to do that for the first HSM. I’d be really interested to know what it was like to stitch the casings on instead of doing the tucks. Previous PostThe HS(not)F 2015 – it’s on!